Google makes wonderful things and that also so silently. 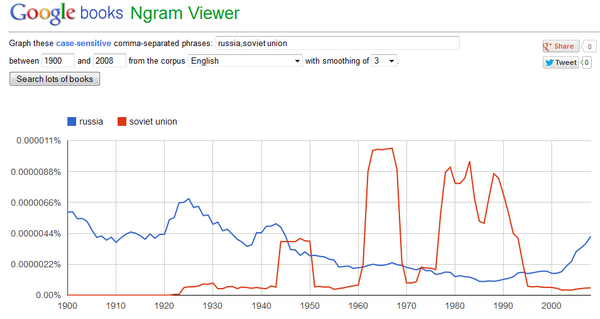 Yesterday I came across a tool called Ngram viewer. A tool that presents you graphical data about how the words, phrases, sentences or grammar is being used in books since the year 100 to till date. This is a great tool for researchers, linguistics, writers and for those who are interested in finding out how the form of language is changing. But everyone can use it and will really love it. Different peoples will use it differently and get interesting results. It's a tool from the Google Book project that searches in the books for finding out how the phrases or words or the combination of words is used since historic times and how the trend is changing. Or compare something like telephone, mobile, phone and cell phone. How you want to use Google Ngram viewer. I am not a linguistics, so I can't give you more interesting examples but you may find it more interesting. 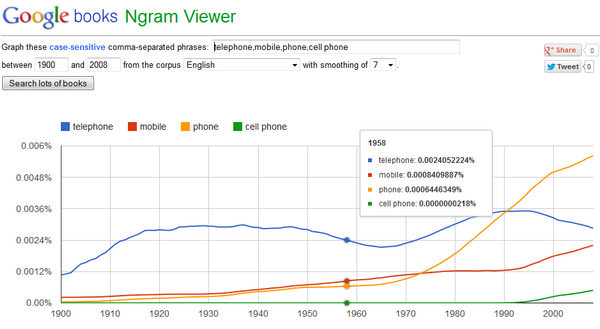 So head over to Ngram viewer now.